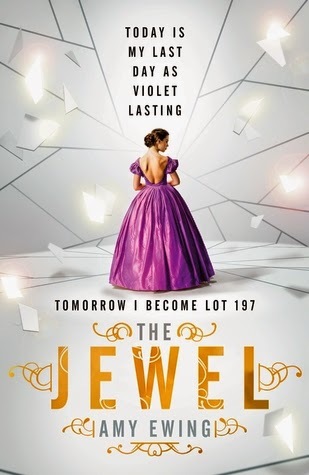 I didn't know anything about The Jewel by Amy Ewing before I picked the book up to read it other than that it is a dystopian YA book being compared to The Handmaid's Tale by Margaret Atwood. I love The Handmaid's Tale and I was incredibly intrigued to see where this story would go and how it would compare to such a well-loved book. I have to say, I thought The Jewel was incredibly exciting and, at times, a shocking story. It wasn't as filled with action as I was perhaps expecting but it built the world nicely and did political intrigue incredibly well and I was always on the edge of my seat worrying about who I thought Violet, our main character, should be trusting and who she should be avoiding. The Jewel centres around this world in which royalty are unable to carry their own children and instead the royals buy surrogates in a yearly auction. Surrogates for sale in this auction are from the poorest communities in this world and they are ranked by their abilities with Auguries. The auguries were something that I found really fascinating and this element of fantasy was one of my favourite aspects of the story. Violet Lasting is one of these surrogates and she goes into the auction as one of the highest ranking surrogates there. I think what really gripped me into the story right from the start is the emotion that Violet feels - at the loss of her name and being separated from her family that she loves so much. I was close to tears in the first few chapters getting to know Violet. I really came to care for her and wanted what is best for her. As she was being prepared for the auction, I did feel some similarities to other dystopian stories, but for the most part, I felt like this book is strong enough to stand on its own. But I did very much love Violet's small acts of rebellion throughout the book that shows she's struggling against the restraints of her life. I haven't talked too much about the events after the auction because I don't want to spoil too much of the story, but as I said at the beginning, I loved the political intrigue included in this novel. Violet is in a position of great importance where she ends up and is privy to really dangerous information and meets with the highest members of this world's ruling power. Right from the very first page, I was hooked on this book. It's a bit of a shocker of an ending which means I'm now dying to read more in this series! Bring it on. This one sounds really good. I've put it on hold at the library! I'm really looking forward to The Jewel! Thanks for the warning about the ending, I know to go in prepared now. I always end up desperately wanting the next book after shocker endings. Great review, glad you enjoyed this one! You're very welcome, Liz! I really did enjoy it :) Hope you do too! I'm glad to see you enjoyed this, I found the premise really intriguing. Will definitely have to get my hands on a copy! Ooh, I'm glad, Julianne. It's one of the few dystopian books that has caught my interest lately. I find myself not really invested in many dystopias. But this one? I need more immediately!